Human civilization's fascination with gold goes as far back as the Sumerians of Mesopotamia (Modern day Iran and Iraq) where gold was first discovered in the third millennium B.C. While the reasons for accumulating gold have been changing over time, the fascination continues unabated. The gold price is surging again. This week it set a new record of about $890 per troy ounce, well ahead of the previous all-time record of $850 an ounce set in 1980. A troy ounce is about 31.1 grams and a tola is 11.7 grams. Some analysts argue that, even at the nominal price of $890 an ounce today, it remains far below the inflation-adjusted high of about $2200 an ounce, based on the current equivalent of the 1980 dollars. There are many factors driving the price of gold in recent times. Among others, the slowing sale of gold reserves by the European central banks and the declining production and falling dollar have been the most cited reasons. However, the one factor that I believe is the most significant is the newfound wealth and the surge in gold demand in South Asia, the Middle East and China. According to the World Gold Council figures, the annual demand in India alone is about 800 tonnes, almost all of it for jewelry. The Indians are estimated to own about 40,000 tonnes of gold, about a third of the world's total. Exact figures for Pakistan are hard to find but demand in Pakistan is estimated at 150-160 tonnes per year. The Chinese are using 220 tonnes a year. A tonne is 32,150 ounces. Most forecasts indicate continuing growth in gold demand as Asian growth continues for the foreseeable future. In addition to the growth in traditional jewelry demand in South Asia and the Middle East, the US dollar erosion and the inflation and recession fears are fueling investor interest in gold and new ways of investing in gold are thriving. Two ETFs called streetTRACKs Gold Trust (NYSE: GLD) and Metal Gold ETF (LON: PHAU) have been very popular vehicles for retail investors. An ETF is an Exchange Traded Fund. It is similar to a Mutual Fund except that it can be traded like regular shares at any time when the markets are open. GLD currently holds 628 tonnes of gold, just behind Japan central bank. Many analysts are quite bullish about continuing surge in gold prices. If, however, Central Banks decide to start selling significant amounts of gold again, gold price could drop. US Federal Reserve alone holds about 8,500 tonnes of gold followed by Germany with 3,400 tonnes. 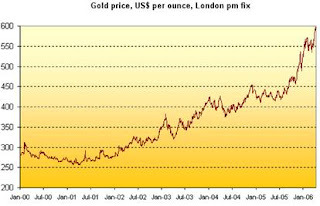 The last crash of the gold price in 1990s was caused by large gold sales by the Bank of England and other European central banks. MUMBAI: The country's gold demand dipped by 12 per cent in 2012 to 864.2 tonne, mainly on account of higher import duties, jewellers strike over proposed measures to curb imports and a sharp rise in the domestic price, World Gold Council said in its recent report. The overall demand of gold in the country had stood at 986.3 tonne in 2011, according to the WGC Gold Demand Trend 2012 report released today. "China and India remain the world's gold power houses. In India, consumer sentiment towards gold remained strong despite measures aimed at curbing demand, reaffirming gold's role in Indian society. In an underdeveloped financial system like India, gold has an important role to play," WGC Managing Director, Investment, Marcus Grubb said. In 2013, WGC expects the demand to be in the 865-965 tonne range, an 11 per cent increase at the upper end, depending on any further government measures, he said. India is likely to remain the biggest market for gold this year followed by China, he said. In the first half of 2012, consumers faced headwinds in the form of higher import duties, market turmoil over proposed measures to curb imports and a sharp rise in the local price. However, the demand staged a strong revival in the second half of the year as the market thrived during the fourth quarter wedding season and festive period. Total jewellery demand in the country in 2012 was down by 11 per cent to 552 tonne, compared to 618.3 tonne in 2011. However, the demand in terms of jewellery value rose by 8 per cent to Rs 1,l58,090 crore, compared to Rs 1,46,067.8 crore in 2011. Total investment demand was down by 15 per cent to 312.2 tonnes, against 368 tonnes in 2011. In value terms, gold investment demand went up by a marginal 3 per cent to Rs 89,412 crore compared to Rs 86,936.7 crore in 2011. "Despite the turbulent macroeconomic climate throughout the year, as well as the regional uncertainties affecting India and China, the two largest gold markets, annual demand was 30 per cent higher than the average for the past decade," Grubb added.